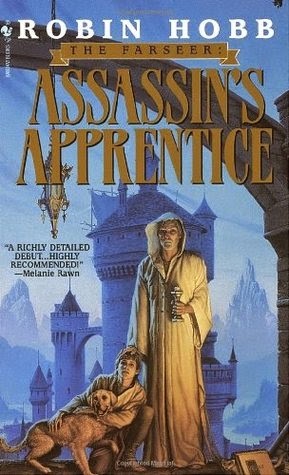 Assassin's Apprentice is the first book in The Farseer Trilogy by Robin Hobb. Available at Amazon, Barnes and Noble, BooksAMillion, and AbeBooks. A lot of reviewers have described this book as dark. I didn't see it that way. I found this book to be cozy sci-fi/fantasy (science fantasy). It stays true to the traditional mode of storytelling and made me think of the sci-fi/fantasy books I read when I was growing up (probably because this book was published when I was a teen). There's a lot of focus on the world that's been developed, The Six Duchies, but that's something old-school sci-fan/fantasy fans expect from their books. The descriptive-details are a far cry from the ten-page description of Minas Tirith found in my copy of Tolkien's LoTR: The Return of the King. Still, readers who prefer the "less is more" storytelling mode will probably feel bogged down by Assassin's Apprentice. At the end of the book, Hobb lapses into telling me rather than showing me the conclusion. I'm not sure how I feel about the change of pace - it helped prep me for the end of the book but annoyed me because the story was far from over (and I don't have the second book yet). This book gave me a hangover so that frustrated feeling was probably a symptom of withdrawal. I received a free copy of this book to review from GoodReads First Reads. Robin Hobb had been on my to-read list for a while and I'm glad I was finally spurred into reading her work. This book was exactly what I needed this week and, yesterday, I ordered the next two books to complete the Farseer Trilogy plus all three books in The Liveship Traders Trilogy.